For most people planning a home addition, obtaining a home bank loan is part of the process. It used to be when seeking financing for a home addition project you’d run downtown to a few local banks, meet with each bank’s loan officer and see what they could offer you. It was a hit or miss process. More often than not you’d walk away empty handed and disappointed. And when you finally found the bank that would give you a loan you often felt like you were personally violated in the process, based upon the high interest rate and terms you were given on the loan. Fortunately times have changed. There are now home mortgage specialists, or mortgage brokers, that can offer homeowners a plethora of options when it comes to home addition financing. Mortgage brokers can effectively connect homeowners to hundreds of home loan financing programs to provide the best possible interest rates and terms to meet a homeowner’s specific situation. They can often even provide homeowners with less than perfect credit ratings a home addition financing loan program, albeit it at higher interest rates. With so many home addition financing options available to homeowners now days it can be challenging in itself in determining the best loan for your specific needs. 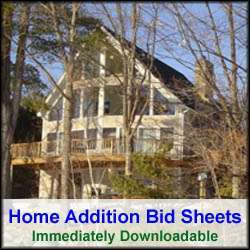 To help in the process figure out in advance the exact cost of your home addition project and how much financing you’ll need. Also, whittle down the number of banks and loan options to just a few, preferably to the types of loan you preferably desire. 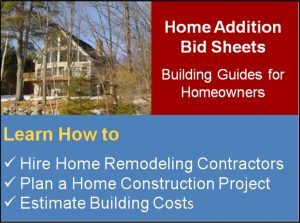 Regardless if you plan to do all the construction yourself or hire a general contractor, it’s imperative to have accurate and total costs for the home addition project prior to approaching the banks or mortgage brokers for a loan. All loan officers will require an accurate cost break down of the project prior to providing you with home addition financing. 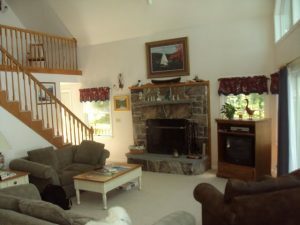 The home addition costs should be broken down into material and labor costs. In addition, the costs should be separated by task, e.g. excavation/foundation work, framing, electric, plumbing, etc. By providing this type of detailed cost breakdown, loan officers will have more confidence in you and the project. As with any investor, the last thing they want to do is to hand over money to a project that is never completed due to insufficient funds. With an accurate cost estimate of your home addition project you’ll know exactly how much financing you’ll need. Whether or not you’ll get the home addition financing you desire, however, will come down to three basic conditions; your credit score rating, your income, and the loan to value (LTV) ratio of the home. Based upon these three key factors, the mortgage broker or loan officer will determine how much money they will loan to you and at what interest rate and terms. Your credit score rating will play a major role in determining how much you can borrow, and the interest rate charged for the home addition financing loan. The higher your credit score the more you will be allowed to borrow and the lower the interest rate charged. The LTV ratio is typically capped at 80% of the home value. So for example, if the home was appraised at $200K, then the max LTV equals $160K. If the home had an existing mortgage of $100K on it, the bank would subtract the existing loan amount from the LTV. Thus, for the $200K valued home with a $100K mortgage, the maximum loan for the home addition financing would be $60K. Banks also have similar formulas for the size of the loan relative to the income level of the loan applicant. Typically the banks want to ensure a loan applicant’s total debt not to exceed 36% of their monthly gross income, and their total house expenses (loan, interest, and taxes) not to exceed 28 to 30% of their monthly gross income. No matter how much home addition financing you seek, keep in mind that the longer the loam term, the more you’ll pay for the total cost of the loan. For example a 15 year loan always has a lower interest rate than a 30 year loan. So whenever choosing a loan program select one with the shortest time duration. In the end you’ll shorten the life of making loan payments and save interest costs in the process.